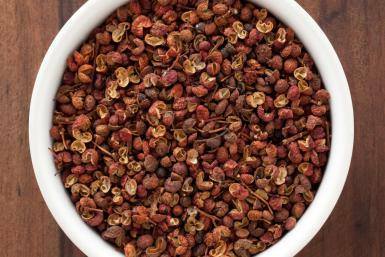 Szechuan peppercorn has a fragrant aroma that has been likened to lavender. However, its main claim to fame is the powerful numbing sensation it causes around the mouth. When married with chile peppers (the other key ingredient in Szechuan cuisine), chefs believe this numbing effect reduces the chile pepper’s heat, leaving diners free to appreciate the capsicum’s intense, fruity flavor. Szechuan peppercorn is featured in numerous dishes. Recipes frequently call for the peppercorns to be ground and roasted. Ground, roasted Szechuan peppercorn is used to make an infused oil and is also paired with salt to make a flavorful seasoning. Szechuan peppercorn is one of the five ingredients that makes up five spice powder (the others are star anise, fennel, clove, and cinnamon). Where can we get this? Chef Yang 46, our sister restaurant in New Jersey, has just opened!